I have been sitting in front of my computer wrapped up in a blanket watching Gilmore Girls. I love the little anecdotes and Lorelai's sarcasm. I kind of hate Rory and would probably make the opposite decision of every big one she made, except maybe dating Jess. But still I love it. Also, the slippers are by Victoria Secret, I recieved them from my cousin because they reminded her of Minnie Mouse, loove them. I also may be one of the few girls that actually admits how much they love McDonalds, it's cheap, greasy, disgusting and soooo delicious. I am pretty much ecstatic that dollar drink days are back. 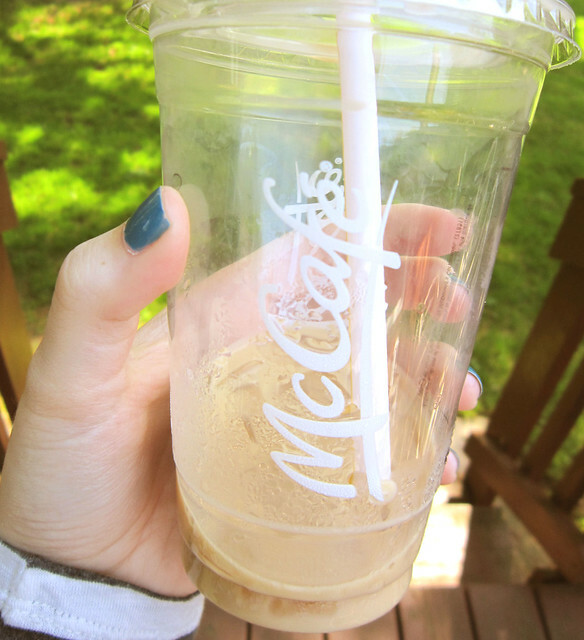 Caramel Iced Coffee's are delicious. (way better than the french vanilla) Also is anyone else extremely unimpressed with the new yogurt and smaller fries with the kids meals, cause I know I am. Who goes to McD's to be "healthy"? 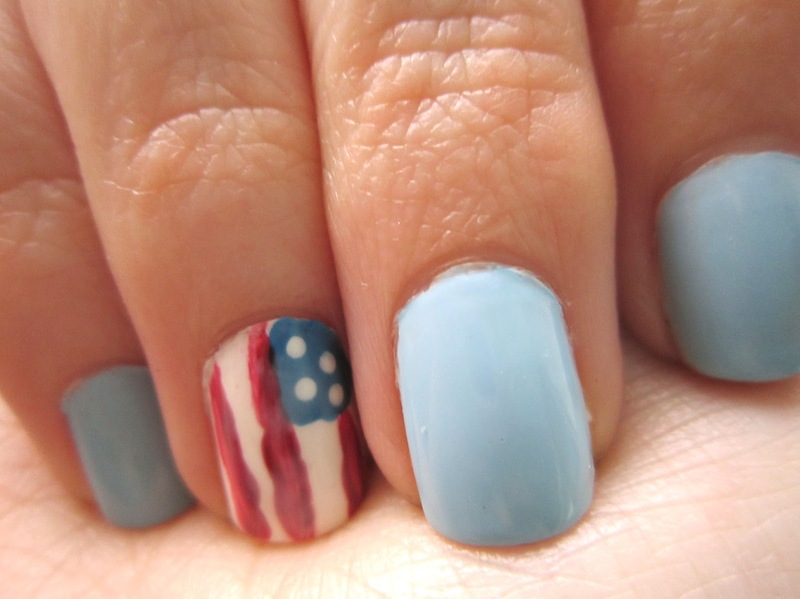 Also, while reading this post by Sammi of Beauty Crush I was inspired by her nails, so I recreated them my self using Joe Fresh Powder Blue on every nail and for the flag used Cobalt also by Joe Fresh, Sally Hansen White On and Essie Red. I also put a layer of Essie Ballet Slippers to kind of tone down the vibrancy of the accent nail. I love Americana and need to get my paws on some piece of American flag inspired clothing but haven't found that perfect item yet. 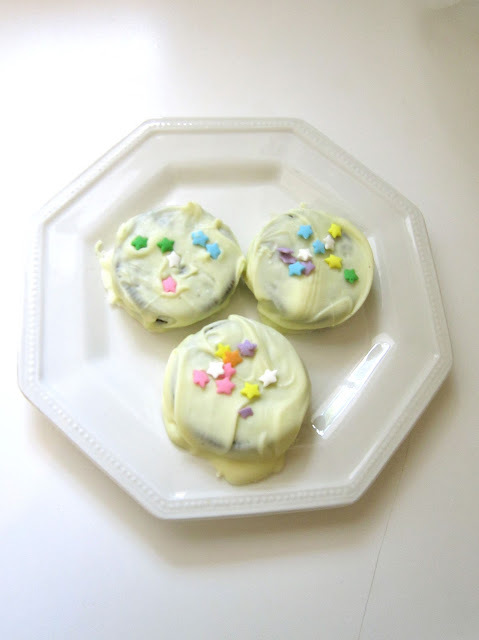 Finally, for Mother's Day I made a batch of white chocolate Oreo cookies, you literally heat up the chocolate in the microwave, dip the oreos in, throw some sprinkles on and cool in the freezer. Et voila, c'est fini. They were yummy, and required very little effort. So there you go, what have you all been up to, if any of you have a youtube, tumblr or blog I'm always down to read / watch new people leave it in the comments! Got to love a bit of Gilmore girls!